Roles are used in service management to illustrate the responsibilities for whole processes or single process activities. This page contains the complete list of YaSM roles and boards. There's another page on the YaSM RACI matrix where you can download the complete responsibility matrix in PDF format. The following table contains short descriptions or definitions of the YaSM service management roles in alphabetical order. Note: Throughout this wiki, "he" is used as a reference to an indefinite person, meaning "she" or "he". The responsibility of 1st level support is to register and classify received incidents and to undertake an immediate effort in order to restore a failed service as quickly as possible or to fulfill a service request. If no immediate solution can be achieved, 1st level support will transfer the incident to expert technical support agents or groups (2nd level support). 1st level support also keeps users informed about their incidents' status at agreed intervals. In some organizations, 1st level support is referred to as 'help desk' or 'service desk'. 2nd Level Support takes over incidents which cannot be resolved immediately with the means of 1st level support. If necessary, it will request external support, e.g. from software or hardware manufacturers (often referred to as 3rd level support). The aim is to restore a failed service as quickly as possible. Developers are responsible for creating the applications and systems which support the service provider's range of services. This includes the development and maintenance of custom applications as well as the customization of products from software vendors. A group of people that advises the change manager in the assessment, prioritization and scheduling of changes. The composition of this will vary depending on the nature of the changes to be assessed. It is usually made up of representatives from all areas within the service provider organization, the business, and third parties such as suppliers. The Change manager controls all changes across their lifecycle. His primary objective is to enable beneficial changes to be made, with minimum disruption to services. For important changes, the change manager will refer the authorization of changes to the change advisory board (CAB). Every change has a responsible change owner, holding the budget for its implementation. In many cases the change owner is identical with the individual submitting a request for change. 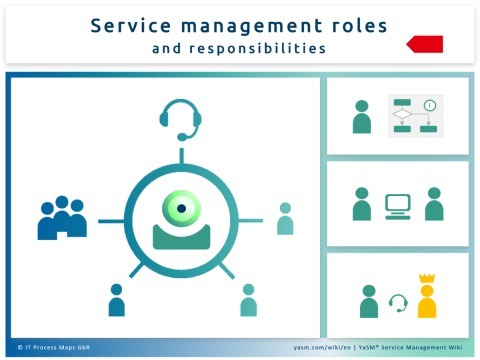 Many changes are owned by service management roles (e.g. 1st or 2nd level support or a service owner). The compliance manager's responsibility is to ensure that standards and guidelines are followed. In particular, this role ensures compliance with internal policies and external legal requirements. The configuration manager is responsible for maintaining information about the infrastructure required to deliver the services. To this end he/ she maintains a logical model describing the components of the infrastructure and their associations. Someone who buys services. The customer of a service provider is the person or party who agrees to use a service with specified service properties at a defined price. The customer relationship manager is responsible for maintaining a positive relationship with customers. This role identifies customer needs and makes this information available to the service provider organization, so that the service provider is able to offer an appropriate range of services. A sub-set of the change advisory board that makes decisions about high-impact emergency changes. Membership of the ECAB is typically decided at the time an emergency change must be assessed and depends on the nature of the change. The financial manager is responsible for managing the service provider's budgeting, accounting and charging requirements. This role ensures that the service provider employs the right balance of staff in terms of skills and experience. The human resources (HR) manager is also responsible for identifying gaps in the organization's current set of skills and for organizing any required skill development initiatives, in line with the service provider's objectives. The incident manager is responsible for the effective implementation of the incident resolution process and carries out the corresponding reporting. He represents the first stage of escalation for incidents, should these not be resolvable within the agreed time frames in the relevant service levels. A dynamically established team of managers and technical experts, usually under the leadership of the incident manager, set up to concentrate on the resolution of a major incident. An operations manager will be needed to take overall responsibility for operating a service. For instance, this role will ensure that all day-to-day operational activities are carried out in a timely and reliable way. Operators are the staff who perform the day-to-day operational activities. Typical responsibilities include: Performing backups, ensuring that scheduled jobs are performed, installing standard equipment in the data center. The problem manager is responsible for managing the lifecycle of all problems, where the primary objective is to prevent incidents from happening if possible, and to minimize the impact of incidents that cannot be prevented. Apart from resolving the underlying causes of (potential) incidents, the problem manager often provides workarounds while a full solution is not yet available. This role ensures that the processes it owns are fit for purpose. The process owner’s responsibilities include the design and continual improvement of the process. In larger organizations there might be separate process owner and process manager roles, where the process manager has responsibility for the operational management of a process. The project board is the decision-making body of the project. The project board typically consists of members of the management board and representatives of the different project stakeholders. It is important that the project board has real authority to take decisions. The project manager is responsible for directing a project, which includes responsibility for delivering the agreed project deliverables within the agreed time and budget. The project owner is the driving force behind a project. Typically, this role will prepare a business case and apply for a budget before a project is set up. As many projects are related to improving services, service owners will often act as project owners. The security manager is responsible for the service provider's and its customers' security. This includes responsibility for the security of information and data being processed by the service provider. The service continuity manager is responsible for managing risks that could seriously impact the service provider's services. In particular, this role ensures that the service provider can provide minimum agreed service levels in cases of disaster. The service design manager is responsible for the detailed specification of the requirements for new or changed services, as well as identifying a suitable approach for their implementation. The service implementation manager is responsible for coordinating the implementation of new or significantly changed services. In particular, the service implementation manager ensures that all service infrastructure and other required capabilities are properly tested and deployed. The service improvement manager is responsible for managing improvements to the service provider's range of services. In particular, this role will identify improvement potentials by analyzing service quality reports and performing service reviews. The service owner holds responsibility for delivering a particular service. In the case of a customer-facing business service, the service owner is responsible for delivering the service as specified in the customer agreement. In the case of supporting services, the service owner will often lead a team of technical specialists or an internal support unit. The service portfolio manager is responsible for managing the service provider's range of services. This includes making sure that the information in the service portfolio and any service definitions are accurate and up-to-date. The service portfolio manager will also support the steering group during strategic assessments of the service portfolio. Service request fulfillment groups specialize in the fulfillment of certain types of service requests. Typically, 1st level support will process simpler requests, while others are forwarded to the specialized fulfillment groups. The service strategy manager supports the steering group in producing and maintaining the service provider's strategy. This role is also responsible for communicating and implementing the service strategy. The SMS manager is responsible for setting up and maintaining the service management system. This role plays a key part in managing the service management processes and policies, ensuring that all elements of the SMS cooperate in a seamless way to achieve the service provider's objectives. The steering group sets the direction and strategy for the service provider. It typically consists of members of top and middle-level management. The steering group has ultimate responsibility for the range of services offered by the service provider. As such, it also authorizes initiatives for the introduction of new or the enhancement of existing services. It is important that the steering group has real authority to take decisions. The supplier manager is responsible for ensuring that value for money is obtained from all suppliers. This role makes sure that the contracts with external suppliers support the service provider's needs, and that all suppliers meet their contractual commitments. The technical domain expert provides technical expertise and support in various service management processes. There is typically one expert or team of experts for every key technology area or type of application or system. This role plays an important part in the technical aspects of designing, testing, operating and improving services. The test manager ensures that newly implemented services deliver the required outcomes, and verifies that all preconditions for operating a new service have been created. The YaSM RACI matrix ("responsibility matrix") provides a summary of the YaSM roles' responsibilities for whole processes or single process activities. 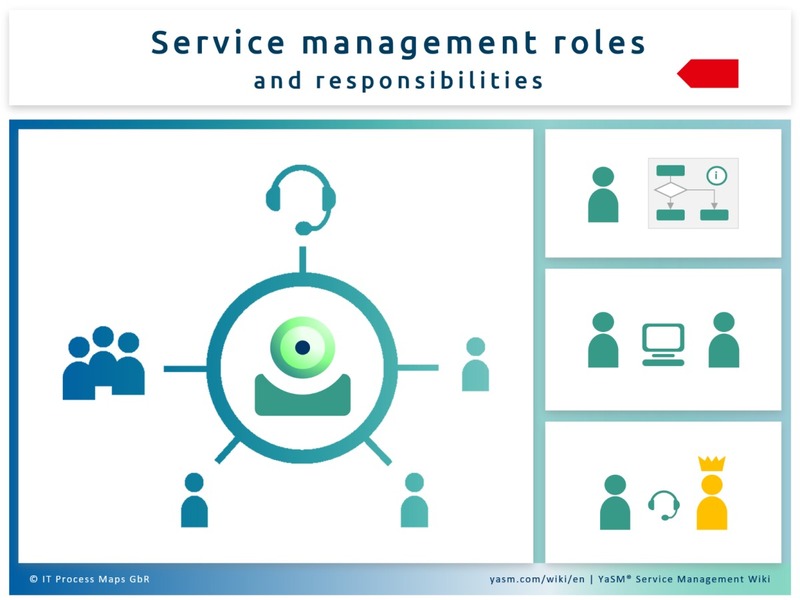 Is based on: YaSM service management role definitions from the from the YaSM Process Map. By: Stefan Kempter and Andrea Kempter , IT Process Maps. YaSM® is a registered trademark of IT Process Maps GbR. ITIL® and IT Infrastructure Library® are registered trademarks of AXELOS Limited. COBIT® is a registered trademark of ISACA. ISO/IEC 20000® is a registered trademark of ISO. CMMI® and Capability Maturity Model® are registered trademarks of Carnegie Mellon University. USMBOK™ is a registered trademark of Virtual Knowledge Solutions International Incorporated (VKSII). SIAM® is a registered trademark of EXIN. VeriSM™ is a registered trademark of IFDC. -- Microsoft®, Word™, Excel®, SharePoint® and Visio® are registered trademarks of Microsoft Corp. ARIS™ and IDS Scheer are registered trademarks of Software AG. This page was last edited on 28 March 2019, at 19:41. Content is available under Creative Commons Attribution-NoDerivatives 4.0 International (CC BY-ND 4.0) unless otherwise noted.